Search the categories on the right for examples. If you can\'t find what you need, then leave a comment on the Requests page! New Add me on Twitter to get tweets on Think Android\'s latest posts! Congrats to Packt Publishing! 1000 Titles and Counting! Just got an email from Packt Publishing with the exciting news that they’ve published their 1000th title! Pretty impressive no? Packt Publishing has come a long way since it published its first book in 2004, and is now one of the leading technical publishers, renowned among developers for its focused and practical books on a wide range of tools and technologies. Packt has just published its 1000th book. You are invited to join us in celebrating this milestone with a gift. Access our library, PacktLib, for free for a week, and choose any of our eBooks to download and keep. To make use of this offer, you simply need to go to www.packtpub.com and log into your account, or register for an account, between the 28th and 30th September. At Packt, we really appreciate your support in helping us get this far, and hope that you will continue to enjoy our range of books. And PS, for those who don’t know, I happened to publish my book with Packt so if you’re interested feel free to download my e-book at Android Database Programming. For this post, I thought I’d revisit the topic of Intents. In the past I’ve talked about passing Intents in between classes with simple, primitive data (see Passing Information between Activities) – turns out it’s a relatively easy task, and a core concept within the Android framework. However, the much harder task is passing your own classes (objects) in between Activities, and moreover, potentially passing lists of objects. In this post, I’ll go through an example of writing an object that implements the Parcelable interface. Consider a scenario where you have a list of Venues (i.e. Restaurants, Hotels, Clubs, anything with fields for lat, long, name, address, etc). Your user makes a request and gets back a list of these Venues. You then want to pass these results to a new Activity – maybe it’s a mapping Activity (as it was in my case), but regardless the goal is to pass this list of Venues from Activity A to Activity B without having to make the same request twice. The first step is defining your object. The object must implement the Parcelable interface. Why you might ask? Well let’s step back and think about what’s happening here. Within Android, much of the inter-process (inter-Activity) communication is done through light weight data structures known as Parcels. In fact, both Intents and Bundles (two objects you’ve probably encountered before…) implement this Parcelable interface. But how does this inter-process communication work? An Android process first converts an object into a byte stream which is then sent to another process (i.e. another Activity). This second process then reads in the byte stream and converts it back into an object: this exchange is more commonly known as serialization or marshalling. But how do the two Activities know what to do to serialize and de-serialize your object? For primitives like ints, doubles, even Strings, serialization is trivial as these primitives are already in byte form. And so this is where the Parcelable interface comes in. So far we have the basic structure of our ParcelableVenue object – it has a few simple fields as well as some standard getters; nothing special there. You’ll then notice that there are two methods we need to override. The first is the describeContents() method. Typically returning 0 suffices unless you have numerous parcelable objects and require special serialization for some. The method itself is meant to return a bit mask that identifies the serialized object. In my case, I just return 0. The second method is the writeToParcel(Parcel dest, int flags) method. The meat of the conversion happens here. In this method you are passed a destination Parcel which is eventually serialized and sent to the end process. Thus you simply need to write your object’s data into this parcel. Luckily, some simple write methods are given to you, such as writeDouble(), writeString(), writeInt(), writeIntArray(), etc. The flags parameter simply tells the writeToParcel() method how the object should be written. Once these two methods are overridden, every class that implements the Parcelable interface then needs to have a static Parcelable.Creator object named CREATOR. Let’s step back one more time – where are we at this point? Well so far we’ve flattened the object and written it to a Parcel object. Our object is in essence nothing but a byte stream now, so the only thing that’s left to do is un-flatten it and convert it back into an object using this CREATOR object! The order here is important – the first double read will be the first double written as, again, it is a byte stream. I won’t say too much about what I’m doing with my Maps Activity – maybe I’ll save this for a future tutorial. The important thing to see is how I send a list of ParcelableVenue objects, and then retrieve them on the other side. As you can probably see by now, there’s nothing hard code wise when implementing a Parcelable object. The difficulty typically stems from an incomplete understanding of how Android sends data from process to process – and this is understandable as almost all of this is abstracted away so that we only need to put simple values into Bundles and Parcels and voila things magically appear on the other side. But once you dig a little more into what’s happening behind the scenes, then all of this serialization and Parcelable implementation makes much more sense. And with that I send you off again! Happy coding and hope this helped. Now a days when people talk about transferring data through HTTP requests, two popular data formats come to mind: JSON and XML. In earlier posts, I’ve written a little about XML (see ), but in this post I’m going to use another friendly library to show you guys a simple, efficient way to parse JSON. I’ll also talk a little about the merits of each data format, but the hope is by the end of this short post, you’ll have what you need to parse both XML and JSON. The “library” I’m going to take advantage of is the JSON-Java library. It’s a really nice, self-contained library, which allows you to easily parse JSON. More recently, the library has even included methods that allow you to convert XML to JSON and vice versa – allowing you to better reuse your data parsers. Anyways, before reading this post, go ahead and download the library and add the source to your project. For me, I just add a new package (i.e. jwei.apps.json) and put the files in there. In the first method, we pass in a String which has JSON format. The constructor of JSONArray expects a String that has valid JSON array formatting and parses it accordingly – throwing a JSONException otherwise. Once we have our JSON array, it works similarly to a vector (ArrayList) and we can pass it an index and retrieve a single JSONObject. For each JSONObject, we can then retrieve various fields by type (i.e. getLong, getDouble, getString, etc). Pretty simple no? 1) Performance – in terms of performance, JSON is the better option. This is true for both the actual transferring of your data, and also for the parsing of the data. This is due to the lower overhead needed for JSON formatting, which doesn’t require the rigid tree/node structure of XML. 2) Readability – this is a more subjective point and I’ve seen arguments for both sides. I personally think XML is the cleaner format for reading, but most browsers now a days (i.e. Chrome, Firefox) have JSON and XML display built in and both are nicely laid out. However, I will mention that for more “complex” data structures, XML tends to display it in a more intuitive fashion, which leads me to my third point. 3) Complexity – while JSON is designed for quick and lean data structures, XML is built to handle data structures of varying complexity and depth. Consider a data structure that has fields which are several layers deep (i.e. a University object which has a list of Class objects which each have a list of Student objects which each have a list of …). When this is the case, it can quickly become a parsing headache when you’re wading through JSONArray after JSONArray trying to access the correct JSONObject. Here, having an XML parser, especially one that is equipped with tree traversing languages like XPATH, can be an extremely powerful tool for pinpointing the precise nodes you want. And so I’ll end the post with that. Hope this was comprehensive and helpful! As always – happy coding. The goal of this short example is to show you how you can further protect your application’s data by enforcing permissions upon your custom content provider. For those who have never seen a custom content provider implementation, I invite you to check out my post Writing Your own Content Provider before reading on. Access to the mail should be protected by permissions, since this is sensitive user data. However, if a URI to an image attachment is given to an image viewer, that image viewer will not have permission to open the attachment since it has no reason to hold a permission to access all e-mail. These permissions are for a specific content URI, and will last until the Activity that receives them is finished. In other words, when an application grants read and/or write permissions to another Activity, these permissions are temporary. Before moving on to some code, let me note that this implementation is different than declaring the android:readPermission and android:writePermission attributes as these tags specify specific applications and give those applications permanent read/write access. 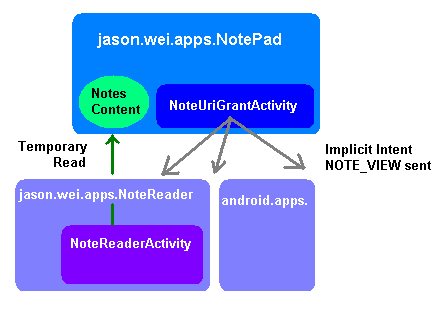 In this way, the method below which uses the android:grantUriPermissions tag a.k.a the sub-tag grant-uri-permission is much more dynamic and flexible. And once the NoteReaderActivity obtains the content of the note, it has the ability to layer on top any additional functionality (i.e. including pictures, videos, other media content) before ultimately sharing it with your friends. Here, at the end of the day, everyone is happy. The NotePad application can allow other applications on the device to consume its content without fear of data corruption, while the NoteReader application can focus on non-content related issues such as UI, media attachments, group sharing, etc. First off – I just wanted to thank you all for making this blog what it is. It’s been great getting your feedback through comments and emails, and I hope this blog has helped you guys in your development ambitions as much as it has helped me! I’m pleased to announce the publication of my first book, Android Database Programming. It was actually through this blog that publishing company Packt contacted me and asked me to write on the topic. It’s currently available for purchase in both print and eBook/Kindle, and can be purchased through the publisher’s website as well as through Amazon. A sample copy of Chapter 2 is also available for free. Hope you guys like it and thanks again for all the support. As always, happy coding. Recently while working on a project I was asked to lazy load a list of images (bitmaps) into a ListView. What made the task even trickier was the fact that each image had to be streamed from a given URL. I thought about downloading all of the images at the application’s startup Activity, and then dumping them into some kind of external SD card as a cache, but I was told that the images were subject to frequent change and that true caching would be difficult. The result is how I chose to implement the feature, and I thought I’d share it with everyone. Now there’s no guarantee that the way I’m doing this is the “correct” or optimal way – in fact if you DO know the best way to lazy load images from URLs then please share – but the solution below works and uses a handful of Android classes and concepts, all of which I’ll note as I walk you through the solution. Before I move onto the code, let’s conceptually think about how we’re going to make this feature work. In this example, let’s say we’re making an HTTP request to some external server that returns a list of Students. Each Student has a name and an image URL which is to be streamed, converted into a Bitmap, and then displayed in a ListView. Getting the list of Student objects is the easy part – but what’s the next step? One option is to loop through each Student, grab each Student’s image URL, convert the URL into a Bitmap, and then allow each Student to hold a reference to their Bitmap; at which point we can load the list like we normally would. A very feasible solution – but depending on the size of your Student list. Let’s assume that each image takes between 0.5 to 1 seconds to load. Now, if your database only has 5-10 Students in it, then maybe this iterative solution may work. However, consider a database with 100s of Students – clearly this iterative solution won’t hold up in that case. What’s the better solution? Wouldn’t it be nice if we could parallelize the loading process? That’s step one – thinking of a way to parallelize the process. Step two is to do all this loading and processing on separate background threads. This way the user can interact with the application, even while the images are loading. The last step, step three, is to make sure that each background thread can somehow communicate with the original ListAdapter and make sure that the list gets updated each time an image is successfully streamed. With that, here’s the code. Alright so what’s going on here? Again, the Student object we have here is very simple – it has only a name, image URL, and Bitmap image associated with it. For now, the image will be null (or a default image can be used) but we choose to hold a reference to it so that once it is loaded, we can “cache” it and only have to load it once. Then, let’s note two things. First, we see that each Student has a loadImage() method which initiates an AsyncTask that we created called ImageLoadTask. By containing the loading process within the Student object, we’ve found a natural way to address step one and parallelize the process. Now, each Student can independently kick off their image loading processes and independently handle the resulting Bitmap. Why do we use an AsyncTask? Well that’s to address step two above and make sure that each process is loaded in a background thread. By doing this, we guarantee that each Student manages their own image Bitmap, and without disturbing the main UI thread! Furthermore, we see that each Student object holds a reference to a StudentAdapter, whose code will be shown next. This is our solution to step three from above. By holding a reference to the Adapter, we can make sure that once the Student’s image is loaded (through the ImageLoadTask), the Student can then tell the adapter to update itself using the Adapter’s notifyDataSetChanged() method. And voila! That’s it! We look through our list of Students, and for each Student we call their loadImage() method, making sure we pass in the instantiated ListAdapter. Then, each loadImage() method will kick off an AsyncTask that will stream the image, cache it as a Bitmap, and then notify the ListAdapter to update itself. How this is going to look at the end will be a list that the user can scroll through, where each row is loading itself behind the scenes, and displaying its image as soon as the loading is done. Hopefully this all makes sense – and again happy to hear other solutions as well! Best of luck and as usual, happy coding. London Olympic Stadium holds 80,000 people. This blog was viewed about 530,000 times in 2011. If it were competing at London Olympic Stadium, it would take about 7 sold-out events for that many people to see it.